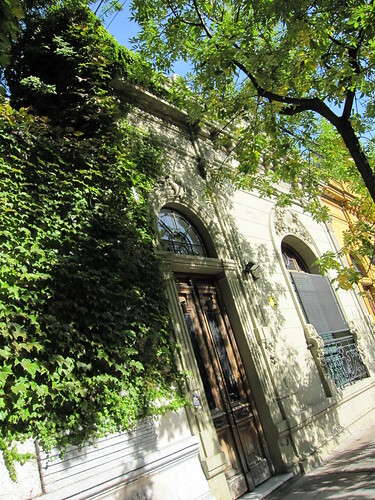 Picture this, if you will: A warm, humid day in Argentina’s early autumn; the last rays of sun slanting sharply through the browning leaves of mature plane trees; myriad dog-walkers rustling quietly by in the litter of those already fallen. In the lee of a giant ficus planted for sidewalk shade, two travelers recline in the canvas-backed chairs of a cafe, unwinding the combined corporeal kinks of a 10 hour overnight flight and a 6 hour stroll around Buenos Aires. As they sit, calm descends over our road-weary protagonists – of the kind unknown and almost unfathomable in their highly caffeinated daily lives up North, yes, a beautiful serenity indeed, interrupted only by a raging thirst. To repeat the lunchtime libation of a world-class Malbec/Syrah blend seems somehow tyrannous to our relaxed travelers, and the option of the Argentine national drink, the Fernet-Coca, somehow dischordant with the peaceful ambiance. Instead, the distinctly un-Argentine, yet surely appropriate, and broadly contextual, selection of a pair of chilled pisco sours has great appeal. Made from a tangy combination of lemon or lime juice, pisco, simple syrup, regional bitters, and egg whites, the pisco sour is the national drink of both Peru and Chile, and its origins lie in 16th century Peru, where grapes first planted by Spanish colonialists were distilled into brandy because the Crown, seeking to protect it’s export trade, banned local wine production. Although it shares its name with a Peruvian coastal town – a title derived from the Quechua word “pisqu”, meaning a variety of “little bird” native to the towns’ surrounding region of Ica – it wasn’t until the 18th century that brandy from Pisco, – having been known previously as simply aguardiente (firewater) or orujo, became synonymous with its home port, as sailors transporting it between the colonies and Spain began to refer to it in that way. Indeed, it was among sailors and other “ruffians” well-known for being partial to strong liquor that pisco first gained popularity, with the loftier classes generally shunning it as the drink of the unstable and unsavory. And, even when the ban on wine exporting from the colonies was repealed, this down-at-heel reputation did not stop it far exceeding wine in quantity sold. Today, pisco is still widely exported from both Peru and Chile, and is drunk by all classes both within those countries and across the world. In it’s native lands it is often sipped neat, and aged varieties – in the same way as aged brandies the world over – command high prices due to their complexity and mellow flavors. The “Quebranta” on the front of our bottle of pisco refers to the typical Peruvian grape varietal it’s made from, which is but one of many used in the distillation of pisco. [For more on these grape varieties and distillation techniques click here.] However, the bulk of exported pisco is clear, aged for only the minimum three months (usually in stainless steel), and destined for the cocktail shaker. The most famous of these cocktails is, of course, the pisco sour. As with many mixed drinks, it’s unclear exactly where and when it was first “invented”, as records of drinks named “punche” containing pisco diluted with lemon or lime juice date from the 18th century, and at the turn of the 20th century the Bank Exchange Bar in San Francisco became famous for its Pisco punch which contained pisco, lemon and pineapple juices. The consensus is though, that in the 1870s an English sailor by the name of Eliot Stubb opened a bar in the Peruvian city of Iquique where he began to experiment with a Latin American version of his favorite cocktail the, then very new, whiskey sour. Quite why he included the egg white in his recipe has been lost in the hazy annals of alcoholic history, but as these pictures amply demonstrate, it gives the otherwise rather ordinary-looking drink a real sense of drama. Why not make yourself a couple of pisco sours this evening and raise a toast to (arguably) the most famous of Argentines, Eva Peron, aka Evita, who would be 90 years old today. In a cocktail shaker, combine all ingredients except bitters. I drank these often when I spent a long summer in Chile (a long time ago!) Nice memories. Enjoyed the history lesson too. Thanks! Aaaaahhhhh, que nice!!! I felt transported to Argentina for a while ;D.
U described a dream, but i do really want to be there to enjoy this!! 😀 What a lovely drink in a lovely place. I have never seen nor heard of this drink – it is cloudy like a pernod but the egg white foam – wow very interesting drink and interesting story…. Wow that’s quite a head of foam you have there was that all generated in the shaker? I love drinks with egg whites in them. 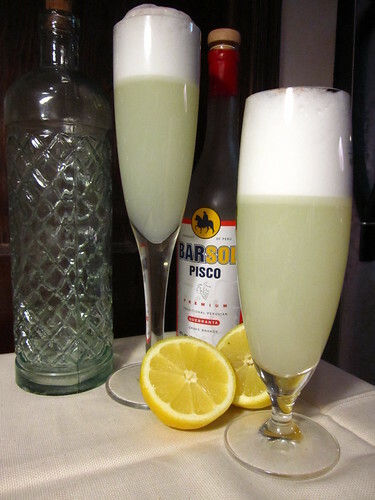 We’ve heard of the egg whites in certain cocktails but not a pisco sour. Love that. This sounds like it’s just sour enough without being too much. doggy – the cloudiness eventually almost completely dissipates leaving a kind of pale yellow/green color, similar in appearance to pastis, but with a head. duo/marc/elra – the head is generated by the shaker, and in fact, we might use a bit less egg white in the future so the head’s a bit more manageable. That said, I think the egg does make the tang of the citrus a bit softer, so if you find yourself armed with pisco, you might want to toy with our ratios un poquito. Such an interesting drink. Beautiful pictures. I am so glad that I don’t have to travel all the way to Argentina (though I would love to) for a good pisco sour. I am so excited about your drink recipe, which I must try in the near future! I remember going to Chile with my family when I was 15 and didn’t really like alcohol, but my parents had me try this and it was pretty good. Haven’t had it since I’ve been able to legally drink, but I look forward to it if I ever get my hands on some pisco. Ahh, yea! Love these. 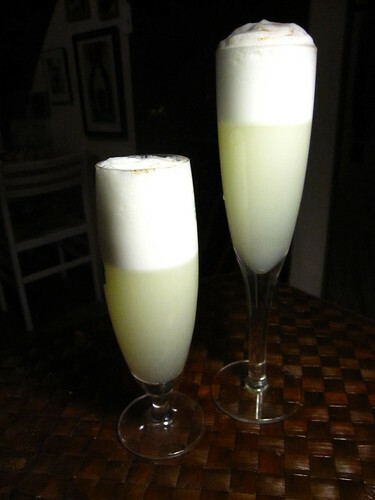 We had a dinner party with eight guests a while ago and put my brother in charge of making the pisco sours. We were only using Mexican (key) limes so it took him forever to squeeze enough for everyone. By the time he made eight cocktails, we were ready for another round. He pretended he wasn’t too happy with his assignment that night. Neat photos too, love the glassware for serving them. if i were somewhere and one was somehow put into my hand? i would drink it, be happy AND grateful and probably want another. @Secret_Ingredient: Thanks for the link! Nice article.